For this post, I’m going to walk you through creating a custom image with DevTest Labs in Azure. We are going to use a VHD from a regular VM. For the copy action we will consider two methods: GUI and powershell. In my case I can deploy the VM I need without any extra work using existing Terraform and DSC. Terraform was not able to work with DevTest Lab back then, so this was the quickest way to set up this VM in a lab. Another posibility is that you have a VM running in production that you want to run tests on. For this post we will create a VM manually to have something to work with. To sysprep or not to sysprep? The short answer is: Whatever works best for you. You don’t need to sysprep, as Azure will do it for you when you create your image in the lab. On the other hand, some use-cases would not work with sysprep, like a domain controller. In either case sysprepping can be left to after the disk is created, as it is a part of the DevTest Lab-options. Artifacts are a lot of fun and very versatile. it allows you to create a basic image and then run applications or scripts while deploying. There are some standard artifacts and you can create your own. I however would like someone without experience to be able to create an image anyway. If you would still have to learn the basics for artifacts, it might actually be quicker to create an image manually. Let’s get started. If you haven’t already, create a new DevTest Lab environment. 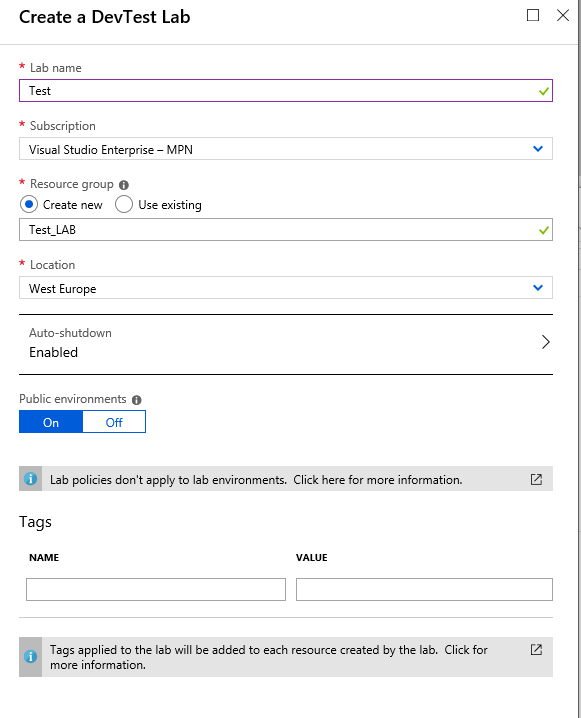 Select DevTest Lab from the “all services section” and click add. You don’t have to bother to much with settings for now, most can be changed later. 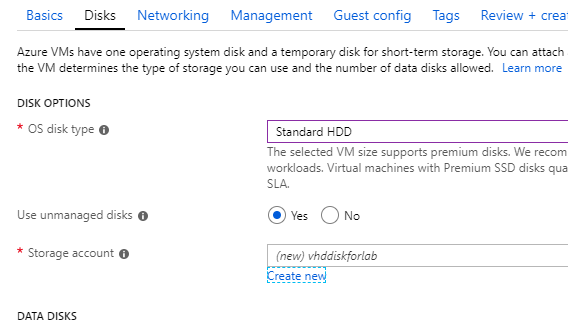 For disks, if you want to use the GUI-method, it is important to select an unmanaged disk as this creates the VHD as a single file, so it’s easier to copy over to the devlab later. This is not supported anymore, but you don’t need support for this VM :). If you are going with the powershell-method it’s no problem to use managed disks. Note the name of the storage account, you will need it later. I selected HDD instead of SSD to save costs. If you use SSD it will be a faster copyjob later on. So we wait a while for Azure to create and start de virtual machine. When it’s ready, you can configure all the things and apps you need for your lab-vm. Now we need to grap that vhd and copy it to the DevTest Lab storage-account. To start the process, stop the VM and make sure it’s deallocated. Microsoft has some pretty good documentation about uploading a VHD to your DevTestLab. It however seems to assume that you want to upload a local VHD. I just want to move mine from one storage account to the other. First, you have to find the name of the storage account of your testlab. This can be done in the portal, just open the storageaccounts-section and search the resourcegroup for your lab. There you will find the name of your storageaccount. But powershell is easier here and you can use the Cloudshell! First, go to the storage account you have set for your VM. Go to Blob Containters > vhds (Leased) and you will find the VHD. Select it and press the copy-button. Then, go to the storage-account for your DevTest Lab. If you go to Blob Containers, you will find de folder uploads. 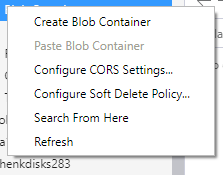 If the folder is not there, you can easily create it by right clicking “Blob containers” and creating a new Blob Container. Don’t forget the name has to be lower case. 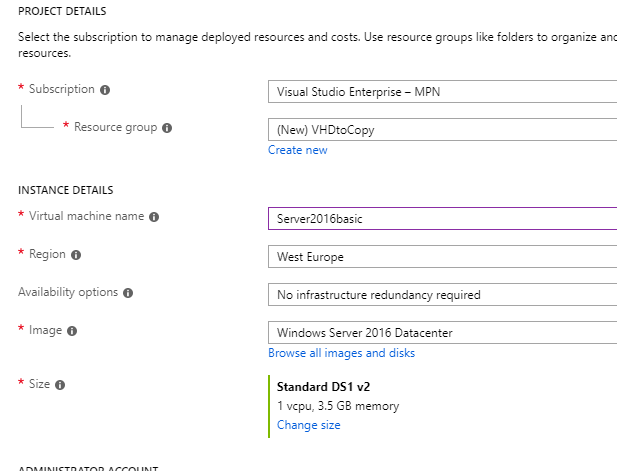 If you place a VHD here, it will become available in de custom-image-menu in Azure. Select this folder, and press paste. Wait it’s that simple? Yes it is. The copy-paste action will take a while though, it’s a large file. $azurermsubscription, the subscription where you will perform the job. $vhdname, the name you want to give your VHD in the lab. $AzurermSubscription = "[id for your surbscription]"
$VHDSourceResourceGroupName = "[resourcegroupname for the vm]"
$LabResourceGroupName = "[resourcegroupname for the lab]"
$VHDName = "[name for the vhd in the lab]"
Write-Host "Copyjob is still pending"
At this point, go to the Azure portal and to your DevTest lab. Select Configuration and Policies > Custom images and choose Add. In the next menu, you should find your VHD in the dropdown menu. If it is not there, wait around a bit, it can take some time for Azure to progress. If you don’t want to have the VM sysprepped, do select this option. This will keep the VM like you left it. Do remember that the standard-logincredentials will not work, you will need to use credentials you have set in your VM. Now, you have a custom image you can use in the lab environment. You can choose to create a claimable VM with it, or let users create their own VM based on this image.